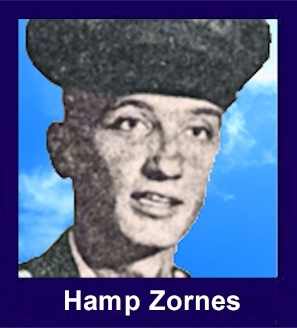 The 35th Infantry Regiment Association salutes our fallen brother, PFC Hamp Edwin Zornes, who died in the service of his country on September 30th, 1968 in Quang Duc Province, Vietnam. The cause of death was listed as Small Arms/AW. At the time of his death Hamp was 21 years of age. He was from Adair, Oklahoma. Hamp is honored on the Vietnam Veterans Memorial at Panel 42W, Line 52. The decorations earned by PFC Hamp Edwin Zornes include: the Combat Infantryman Badge, the Silver Star, the Bronze Star, the Purple Heart, the National Defense Service Medal, the Vietnam Service Medal, the Vietnam Campaign Medal and the Vietnam Cross of Gallantry with Palm Unit Citation. 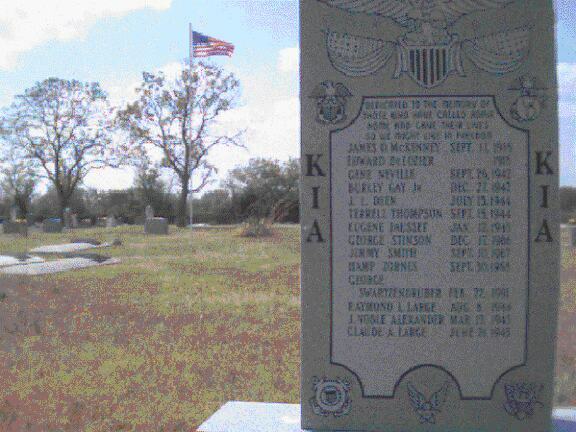 The picture at the left is Hamp's burial place; The Mays County Cemetery, Adair, Oklahoma. Click on the picture to enlarge it. The Memorial plaque lists all the Mays County men lost in all wars. RIP Hamp! For gallantry in action while engaged in military operations against an armed hostile force in the Republic of Vietnam. Private First Class Zornes distinguished himself while serving as a Rifleman with Company C, 2/35th Infantry. On 30 September 1968, Private First Class Zornes' platoon was conducting combat operations north of Duc Lap. As his patrol maneuvered along a highway it was suddenly subjected to intense small arms, machine gun, mortar, and B-40 rocket fire from a numerically superior enemy force to its front and right flank. Unhesitatingly, Private First Class Zornes retaliated with accurate automatic weapons fire enabling his squad to move to a more advantageous position. During this move some members of his squad were wounded and immobilized in the open, exposed to the hostile fire. With complete disregard for his own safety, Private First Class Zornes rushed from his position of relative security through a vicious hail of enemy bullets, grenades, and mortar fire and placing one of the wounded on his shoulders, brought him to safety. During this act of bravery, he was wounded. Disregarding his wound he returned to the exposed position in an attempt to save another comrade. As he was attempting to rescue a second soldier, Private First Class Zornes was mortally wounded. Private First Class Zornes' extraordinary bravery, preserving concern for the welfare of his comrades, and exemplary devotion to duty are in keeping with the highest traditions of the military service and reflect great credit upon himself, his unit, and the United States Army.